Coming from the Netherlands, China White has a strong musical history that dates back to the early 1990's. Over their twenty year journey they have released numerous EPs and compilations garnering some respected reviews and a host of fans. Challenges is their latest work, and only the second full-length CD of original material. If you dig progressive rock with the huge flavor of an old school 70's style, this collection is an auspicious and entertaining slab of music. 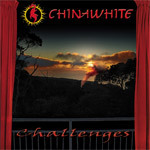 China White's Challenges is a profound and surprising work of intriguing progressive rock with a strong, but not nostalgic, flavor of old school prog. Quite recommended.